I want to share with you something new I tried this weekend. 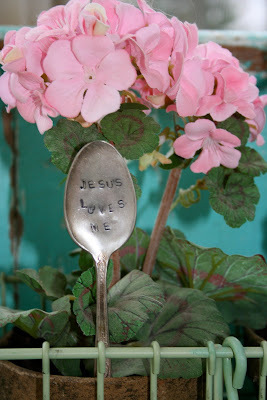 I have always loved these engraved spoons. Normally they are made into markers for herbs, but I thought it would be fun to do phrases. So when I was visiting Anne Sutton (of Bunny Hill Designs) blog, Bunny Tales, she had the directions on how to make these and I dove right in. I have got a long way to go to perfect this skill. Swinging a sledge hammer isn't as easy as it appears, and obviously that causes the letters not to be straight on these first few tries. I love the simple, rustic look about them, though. My mind is running with ideas, but I need to practice a bit more. I hope that you had a wonderful weekend and that Monday proves delightful. You beat me to this post idea. Ha ha I guess that's o.k. though, because you are the one who had to swing the sledge hammer. Anyway, I love it! Your spoons are adorable. And I especially love what they say. :o) You are doing a great job. Those are precious! I would hammer my thumb but thats okay. I prefer to look at the wonderful work others do. 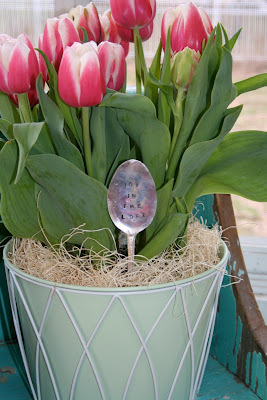 I'm headed over to see how to do it right now!~ I love your un-perfect lettering-it's beautiful! I love this! Thank you for sharing the glory of the Lord! The spoons are a treasure and how clever you are. 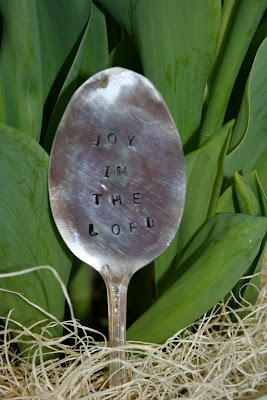 Love your spoon plant markers and the sayings are great the way they are. I can't imagine you slinging a sledge hammer either. Thanks for the link. I have been wanting to do a container herb garden. Those would be perfect for it. Also, wanted to thank you for your Sunday Scripture. It always seems to be what I need. Are you tired of me telling you how much I love this blog?! This is a great idea. I do have Bunny Hill bookmarked, but I rarely read her blog; thanks for sharing this. I need to make some of these!! Thanks for the visit. I live in the GrandHaven-Spring Lake Area. 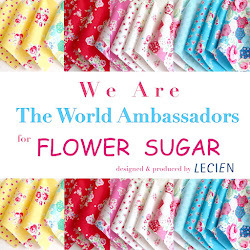 I blogged about my friend nancy who does a lot of sewing and quilting. She was a homemake teacher for years until the schools dropped that subject.